My husband and his brother found "The Black Beauty" in an ad when they were picking up a pizza, and my husband and I traveled to northern Indiana to have a look. All I could think about the next few days was how I could arrange to own that motorcycle, and two weeks later I was proud to call her my own. She's taken me about 30,000 miles since 2006. We've seen Michigan's Upper Peninsula together, many treks around MI and OH, a great trip through and around Pennsylvania, and even a trip to Maine, via OH, PA, NY, VT, and NH. 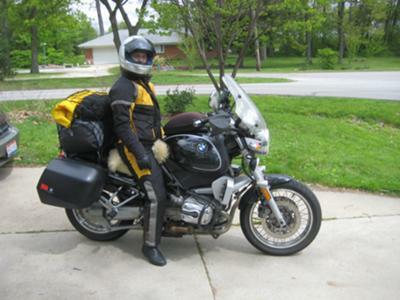 This photo was taken as I was leaving on my second solo moto trip to and through Southern Ohio in May, 2010. Camping at night was down to freezing (but I had proper gear), but the roads and historical and archeological 'research' was quite fun. Marietta, OH, is a beautiful little town nestled amongst the banks of the Muskingum river as it empties into the Ohio river. There are many Indian Mounds in the Southern-Ohio region left by the Hopewell and Adena tribes (I think more than 70 have survived), and there are even some sites of Petroglyphs that have been left relatively undisturbed. Thanks for sharing. I felt like I was there riding with you as you described your journey. I give you lots of credit for riding alone on some of your journeys. What a excellent investment! I enjoyed reading of your adventures, and I love that bike. I'm a BMW rider myself. Hope you enjoy many miles on Black Beauty! Now that is an inspiration! Looking forward to feeling as free and comfortable on my bike as you are. That sounds awesome. Hope to take rides like that one day.